This is another try at some covert iPhone pictures in a restaurant. These aren’t as good as I hoped but I figured I’d give them a shot anyways. Last night we tried a sort of local raw restaurant, Organic Garden Cafe in Beverly, Ma. 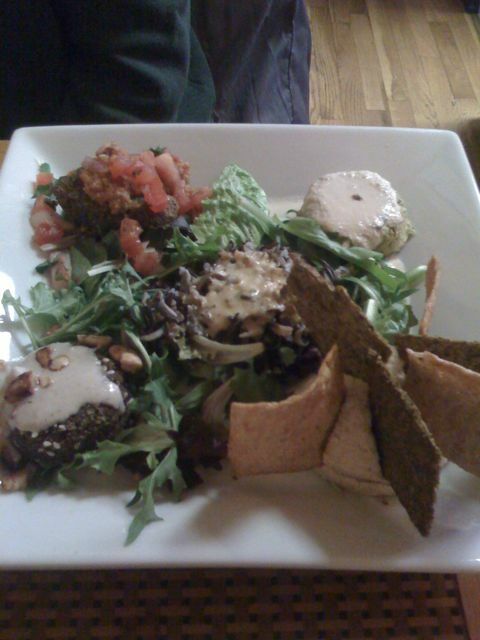 This was my first experience with a raw food restaurant and raw food in general. This isn’t to say I’ve never had raw veggies, fish, or meats before, just that this is the first restaurant I’ve went to that specialized in raw food. Let me be the first to say that I don’t buy into the science of the raw food diet but I am always interested in new (un)cooking techniques. Raw foodies make liberal use of food dehydrators to create a myriad of foodstuffs; raw crackers, rollups, tortillas, and burgers all come out of this raw oven! These things alone were enough to spark my interest and try to deconstruct the dishes I was served. 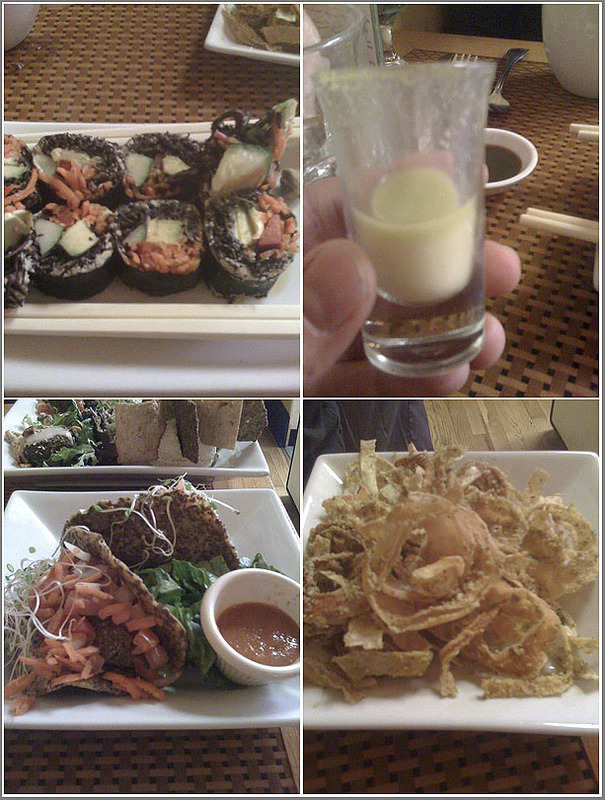 Since this was my first experience with raw dining, we ordered all sorts of dishes. We started out with some tacos. The shells were made from some sort of dehydrated wonder that almost hit the mark for a tortilla, albeit a bit too thick. The tacos had a falafel-like filling and all necessary taco sundries. Overall the tacos did not disappoint. We then had a sampler plate of several small dishes: an assortment of savory items that included a Thai Dumpling, Falafel, Hummus, Mini-Sunburger and, and a sprouted wild rice salad. The hummus was pure sesame paste with several dehydrated crackers that I was sure were cooked in an oven (they weren’t). The falafel was pretty standard and the sun burger wasn’t all that special and overall pretty bland. The winner on this plate was the Thai dumpling. I’m not sure what went into it but it was very gingery, had a cashew cream sauce, and came with some very flavorful candied cashews; I could have eaten four or five of them. Next up we tried their Mauna Loa Maki Roll. Think maki sushi, but replace the rice with something they claimed to be sea veggies. Macadamia Miso Paste, Avocado, Mung Bean, Bell Peppers, and Cucumber rounded out the roll which ended up being really good. The sea veggies gave the maki roll a nice texture and I didn’t miss the rice one bit. I’m going to have to find some of these sea veggies and do some experimenting of my own! After what seemed to be a mountain of food, we couldn’t resist ordering the onion rings. This is another wonder dish that came straight out of the dehydrator. The rings were thinly sliced and coated with a sweet and nutty batter. The rings come out room temperature but you won’t miss the burning hot onions that always seem to sear the roof of your mouth. This may have been the first time I’ve ever had cold, crispy rings and loved every minute of it. I couldn’t leave without checking the drink menu to see what sort of exciting juices, smoothies, or shooters they had available. To my surprise I saw something that claimed to be a ginger shooter. Pure ginger, juiced: pretty simple, right? Boy was I shocked when I took a REAL big drink of this tiny little shooter. It was like drinking ginger flavored hot-sauce, something I really should have expected but didn’t even think of in the moment. It was shocking how much flavor was packed into this tiny little glass. I managed to persevere and drink the entire shooter but I may pass on this one in favor of the, much safer, wheat grass next time. Overall I liked this place. The dishes were creative yet not pretentious and the atmosphere was nice: a small restaurant where I could eat the food and not get harassed by all the raw-food hype that seems to be out there on the interweb. If you’re in the neighborhood of Beverly, MA, stop by this place; I recommend it. I am new to the whole raw food eating myself. A friend of mine, who is a fanatic about this type of eating asked me to read a great book titled, “The Live Food Factor,” by Susan Schenck. I was totally skeptical til I read this book. I have been eating raw food now for 1 month and do notice a difference in how much better I feel everyday.